"Wintertime is the perfect time for doing magic and snow is a beautiful medium for doing this magic. Winter is a time for reflecting and going inward, there is great power in setting long-term intentions in winter and seeing them manifest in the spring." Every month at the beautiful Pacific Yoga studio in Bristol I draw inspiration from one of the many awesome Hawaiian goddesses to guide a group of yogis through a class called ‘Ageless Goddess’ a brand new style of class I designed especially for the studio. Drawing inspiration from goddess mythology of the Polynesian islands, this joyful class draws on a jewel-box of techniques including breath-work, face yoga, acupressure, yoga asana and Hawaiian hula dancing to energise your body and your mind and ignite your inner fire goddess. Its a unique celebration of movement, mythology and ageless magic! 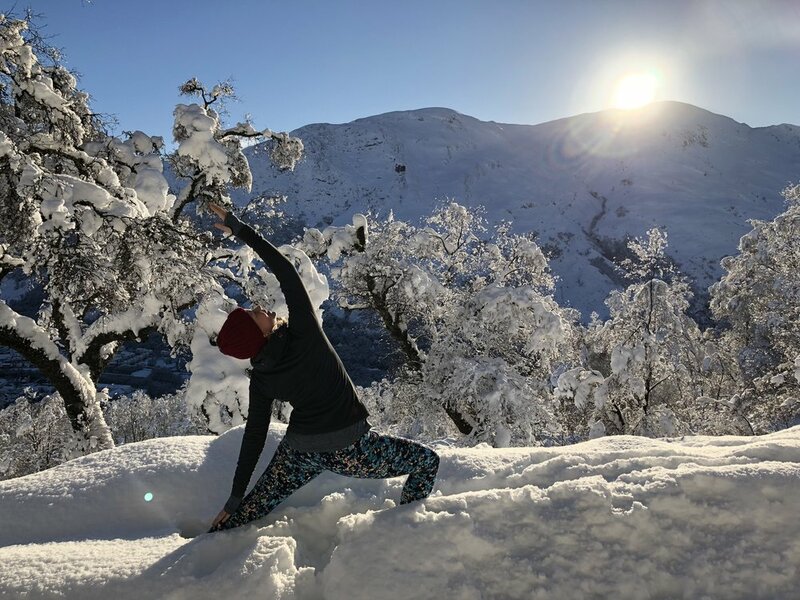 And because our December class will be inspired by the most beautiful of all the Goddesses; Snow Goddess Poli’ahu, I thought I would take some time to introduce you to this amazing goddess…. Polynesians encountered the snow goddess, Poli’ahu, for the first time when they reached the Big Island of Hawaii sometime in the Fourth Century C.E. and beheld the snow-clad summits of the great volcanoes. The eldest daughter of the sky god, Poli’ahu is the goddess of snow capped mountains and has a real fondness for sledding! Though she regularly visits Haleakala on Maui and Mauna Loa on the Big Island, Mauna Kea–in Hawaiian the “White Mountain”–is rightly considered the home of Poli’ahu. The prominent surviving myth about the Goddess Poliahu involves her besting the Volcano Goddess, Pele, at the Hawaiian sledding sport of “he’eholua”. So angry was Pele at being defeated that she attacked Poli’ahu with streams of glowing lava. Poliahu retaliated by bringing down storms of snow to freeze the molten rock in place. The goddesses fought each other to a standstill, although the sledding defeat has always rankled Pele. Even now as she dominates at Kilauea, Pele submits to Poliahu’s rule on Mauna Kea; still, to this day, Pele is said to dispute with Poli’ahu over Mauna Loa! How does this inspire our ‘Ageless Goddess’ Class? Poli’ahu, like many of the pacific goddesses is strong and powerful, as well as being beautiful. We’ll channel this strength with some strong slow yoga flow, and channel the ancient art of hula dancing - calling on the goddesses with dance. Just as pacific islanders have done for centuries. We’ll work though some basic hip movements, then adding in some special arm movements to tell a story via the dance. To bring prana and smiles to our faces we’ll also start with some face yoga so we are all looking as beautiful as the goddess herself! Our next Ageless Goddess Class is on December 15th, 2:30 - 4pm at Pacific Yoga Book your place now and See you there Goddesses!